Beth Israel Jewish Congregation President Joanne Sudman, left, and Rabbi Carla Freedman with the 11 memorial candles lit at a SCC community event Oct. 30 honoring victims of a shooting at a Pittsburgh synagogue. It is believed to be the deadliest attack on Jews in U.S. history. “We are blown away by the turnout tonight,” said Rabbi Carla Freedman of the Beth Israel Jewish Congregation, host of a community event to honor victims of the hate-fueled Oct. 27 synagogue attack in Pittsburgh. It was a standing room only crowd of about 350. Joanne Sudman, congregation president, added: “We are overwhelmed with gratitude and appreciation for the hundreds of neighbors who joined us for the memorial service. 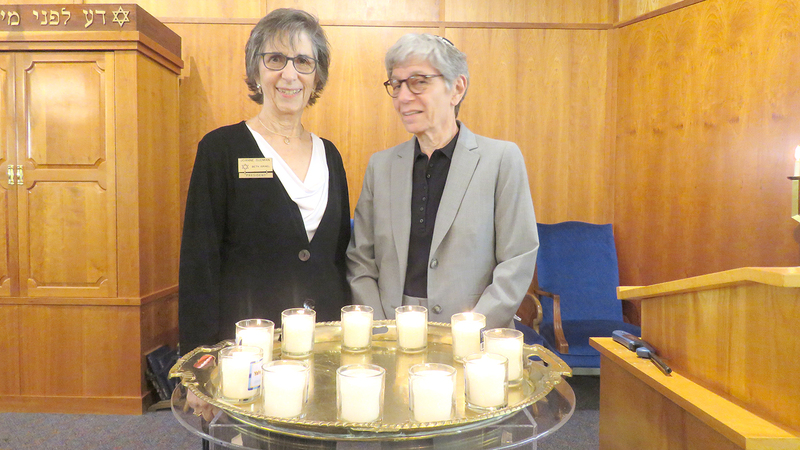 Your support strengthens our belief that religious practice does not define our love and compassion for each other.” She said the first expression of support and sympathy came on Sunday when Kathy Shea, a Kings Point resident, brought flowers to the synagogue. The Oct. 30 service was an emotional one. Eleven people representing various churches and neighborhoods lit memorial candles, while Sudman made personalized comments about each person killed. Reverend Tim Shirley (SouthShore United Church of Christ) read Psalms 23, which he pointed out made only one promise — You are not alone. Reverend Lee Miller (St. John the Divine Episcopal Church) read a poem titled We Remember Them. Cantor Glenn Groper (Beth Israel) led in singing “Blowin’ in the Wind” and “We Shall Overcome,” as well as prayers in both Hebrew and English.